Christy Marx designed two games for Sierra. Her first game was Conquest of Camelot, a tale revolving around the Arthurian legends and the quest for the Holy Grail. 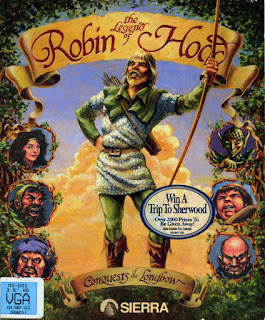 The second game in the so-called Conquest-series was Marx giving her spin on the legend of Robin Hood. 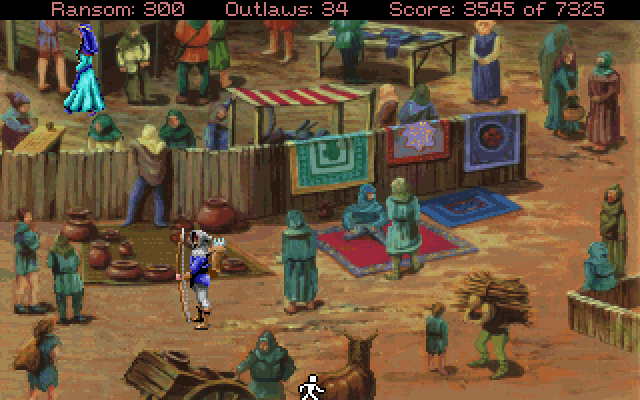 Just like Camelot, Longbow is one of the more unique titles in the Sierra roster, especially considering the time it was made in. 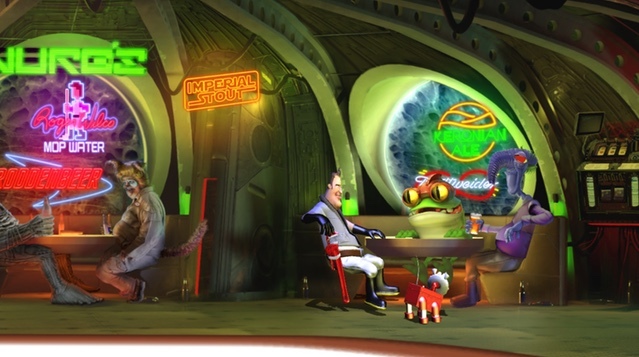 Unlike many other adventure games of the era, it has a much higher emphasis on the story and the narration. The game itself uses, then brand new for Sierra, mouse-driven interface and is presented in glorious 256 colour VGA. The story begins with the troubadour singing the ballad of Robin Hood. As you might know, the setting remains more or less familiar: King Richard has been captured by King Leopold on his way back home from the crusade and Prince John is trying to capture power while the queen is trying to collect enough money to pay the ransom. In Nottingham, the sheriff is tightening the screw around normal folks, demanding more taxes and hanging those who dare to shoot the kings' deer for their supper. And from there enters Robin Hood to the picture, already a known bandit, who is fighting in his own way against the injustice of the land while the rightful king is away and those entrusted power are misusing it to their own ends. King Richard is captured by the men of King Leopold. He doesn't look too happy about it. This version of the tale, while very detailed and throughout researched just as Camelot was, is presenting a tale with a different vibe in it than it usually has. Marx is again spinning a tale that is mixing together the old legends with references of pagan gods, old Druidic believes, folklore and mystical beings. The Sherwood forest has among its inhabitants' mythical beings as well besides the good fold of England and even maid Marion is a more mysterious character, being both a noble lady as well as a priestess of the forest. When Robin finally meets Marian in this tale, they do not yet know each other in the beginning, he has to prove that he is indeed on her side and is willing to help her and the queen raise money for the ransom of King Richard. While Robin is smitten from the first glance of her in a dream, this can remain one-sided affection, if he fumbles too badly. The more typical parts of the story are present as well. The merry men of Robin Hood consist of 30 men, of among which are John Little, Friar Tuck and Will Scarlet. You don't see most of those men, but during the game, you do get to recruit some more. Depending on how you do some tasks, you might lose some. The more daring heists are executed from the plans drawn by the closest men of Robins, of which you have to choose the best one. This can lead to success, failure or something in between. 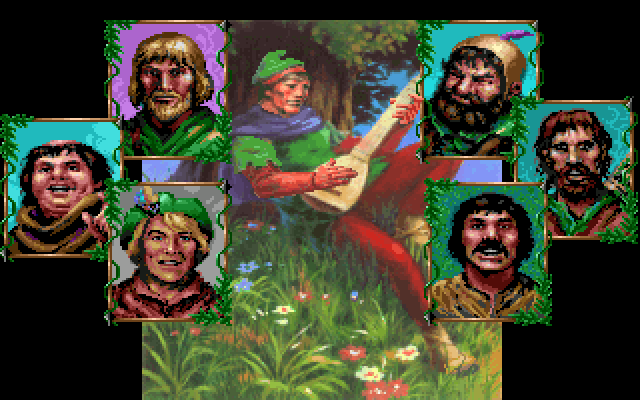 Robin Hood, the blonde bearded dude, and his merry men whom he has actual interaction with. While he can lose men during some raids, I do believe none of these fellas can kick the bucket. Just like on Camelot, Longbow has a three-tier scoring system. The first is the more typical Sierra point system, that awards you with points from solved puzzles and performed actions. The second is the ransom counter, that is keeping track of the money you have managed to rise towards the ransom of King John. You need to collect at least 50 000 marks through different heists and what not. The third is a counter keeping track of your men and how many of them you manage to keep alive to the end. 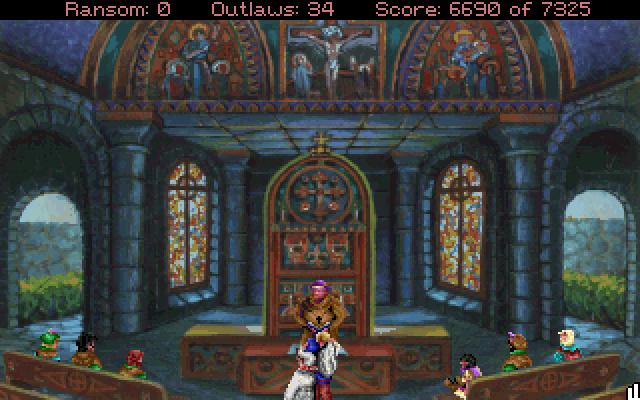 Unlike many other Sierra games, you can play Longbow through in several different outcomes, the story has over 10 different variations, which range from Robin failing to raise the money and failing to win the affections of maid Marion to Robin getting a full pardon to himself and his men. The worst possible ending has Prince John walking away with Robin hanged because of his crimes. On my own playthrough I managed to score over 6690 points of the possible 7325 and got a good ending, but considering the score difference, there are things I most likely didn't see in the end or during the game. Those remaining points can hardly be additional bonuses from obscure things. 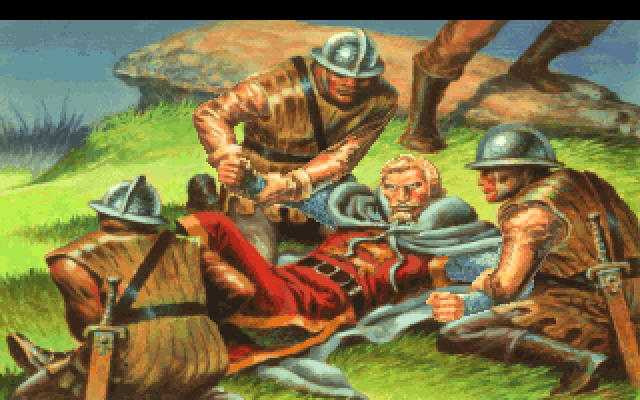 Conquest of the Longbow has a tremendous amount of replay value for an adventure game and especially for an old adventure game like this is. In the time it was made, adventure games were, more or less, linear affairs, where the path was hard set to end up with only one possible outcome. 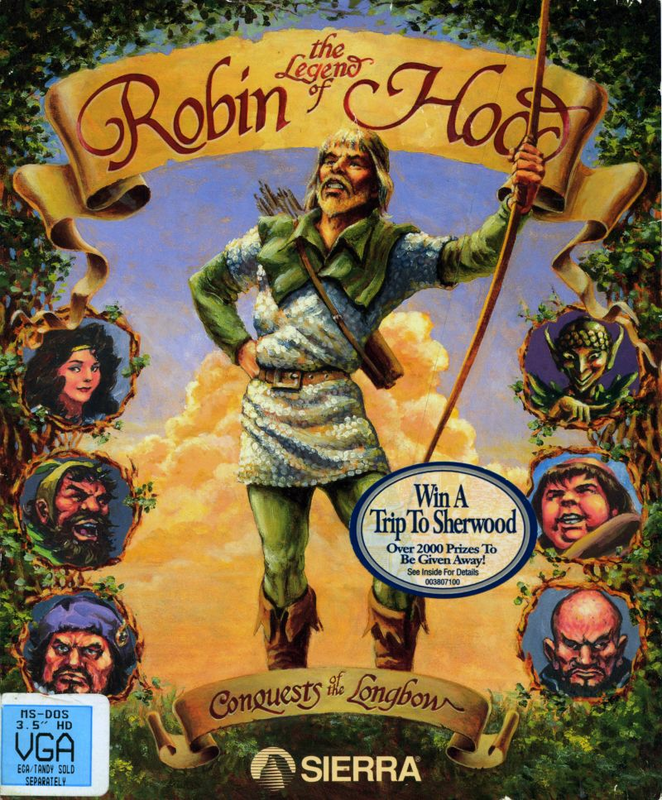 With Longbow, Marx designed a game, that trumps most of the adventures that have come before or after it in terms of possible ways of possible endings. You can mess up a lot or you can outsmart every villain in the game. Robin visiting an ancient oak in the middle of the Sherwood forest. Of course, Longbow has puzzles in it that do require you to have the manual at hand, as there is vital information in there that isn't told in the game. And like all Sierra games, you can die a lot, albeit in logical situations, so saving often is not only smart, it is mandatory. So if that irks you, you might have issues with the game. But unlike many other games from the era, there aren't situations that would end up in a walking dead scenario, where you can't progress because of a mistake from hours and many saves earlier. So in that sense, it is at least to a degree a rather typical old-school design at the same time it is something a bit different. The puzzles themselves are mostly pretty fair. Even the manual based puzzles do end up feeling like genuine puzzles, as the answer isn't written straight in some corner of the page, but require some thinking. Two hardest puzzles are perhaps the Puzzle Box-puzzle, where you have to figure out from where to get a correct code word for a locked box and riddle puzzles, where you are asked several riddles. In one you have to use gemstones, of which influences are told in the manual, to point three gems according to the riddle, in one you just have to know the right answer to a riddle asked. For the latter, I had to check for an answer from the net, as I couldn't figure it out. Graphically Longbow looks just as good you'd imagine Sierra VGA from the '90s to look like. 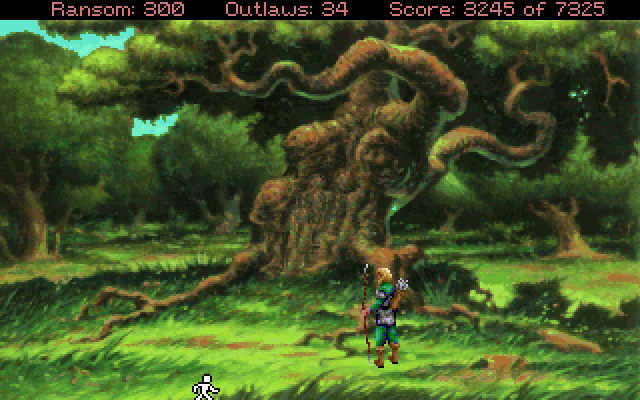 It isn't necessarily THE best looking game Sierra did during this time, but the graphics do look very nice, at least on par with King's Quest 5. The animation is as good as in any Sierra game from the time and the soundtrack is solid enough. While some Sierra games from this era did come in a voice acted version as well, this wasn't one of them. Disguised Robin at the fare in the town, prepared to enter in the longbow competition. Both of the Conquest games are among the more interesting titles Sierra published. Despite that, neither of them has been that well known and are less talked about even among the fans of Sierra games. 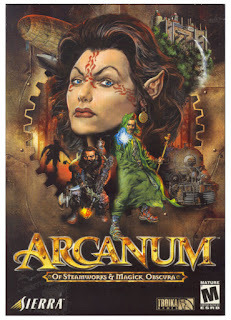 It is a shame, neither of them has ever really gotten the recognition they deserved, as they are better designed than many of the other better known Sierra titles. Longbow especially feels at times almost modern in its approach of multibranched progression. In many ways, it is a shame Christy Marx didn't design more games for Sierra, as her work is among the more interesting stuff the company published. 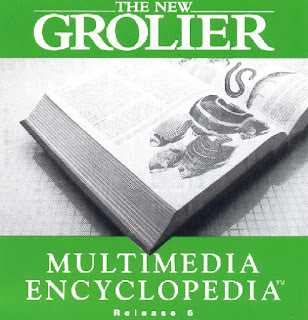 Marx clearly devoted a lot of time in researching the stories shes was compelled to turn into games, which is evident from the manual itself for Longbow with its own reference list of books about the subjects shown in the game. She was, just like the creator of Gabriel Knight Jane Jensen, willing to walk the extra mile in order to bring something more to the table. If there are adventure titles from the '90s and '80s that deserve more widespread recognition, the Conquest games are among them and high in the list, if you ask me. Both of these games can be bought from GOG.